My Wii U has a virus, how do I clean it!? Good news! Your Wii U is CLEAN. 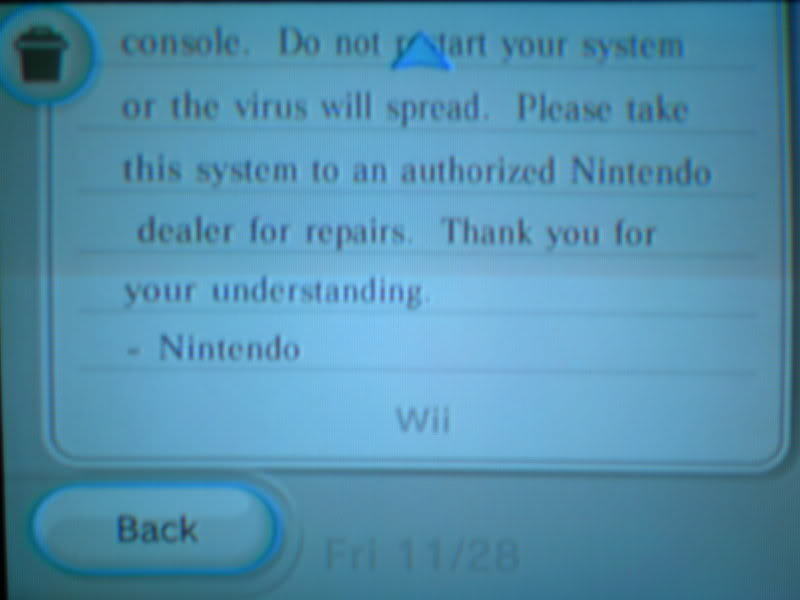 Let me explain… my website recently received a search query asking how to remove a virus from a Nintendo Wii U. I did some digging and see that people have pretty much been asking questions about Wii U viruses since the system launched. I was able to put the pieces together and figure out what’s going on! It’s important to know that both of these messages are fakes. One is a pop up ad on the internet, designed to trick computer users into buying fake antivirus programs, or downloading things which normally would infect a regular computer. These are just advertisements on the websites you are visiting, they are not genuine messages from the system itself. The second, “message type” warning is no different than a chain-letter, or forwarded email. It’s spam! It’s just a person with nothing better to do with their time than send these messages to random “friend codes” and usernames it has encountered in games or seen online. This is a mean spirited prank and nothing more, I promise you. If you’re still convinced that you do have a problem, don’t take my word for it: check out Nintendo’s online support documents. A search for the word “virus” didn’t return a single result – but to ultimately put your mind at ease, you can contact support as well, and ask them about it. It is generally accepted that there are no viruses on the Wii or Wii U because not enough is known about the Wii and Wii U architecture to exploit it with some kind of virus (in short, “Wii’s can’t run Windows “.exe” files). Even if you visit a web page that would infect your regular computer, it can’t infect the Wii U because they are designed to behave completely differently. While it is true that the same things that allow for homebrew applications to be installed on it, or pirated games downloaded to the old Wii are of course things that could potentially be used for evil, those communities are filled with people trying to help each other, not hurt each other. We should never say it’s completely impossible to get a virus, but it is just completely undocumented. There is no evidence of an actual virus being installed on one of these game consoles – only evidence of a message showing up on people’s screens (and almost only EVER in the Browser). That is not cause enough for concern. So relax and get back to your games!